For 15 years, Comfort & Joy has been providing respite to wayward desert queers and their friends. What started in the back of a box truck has grown into the massive and welcoming Comfort & Joy Village that we all enjoy today. 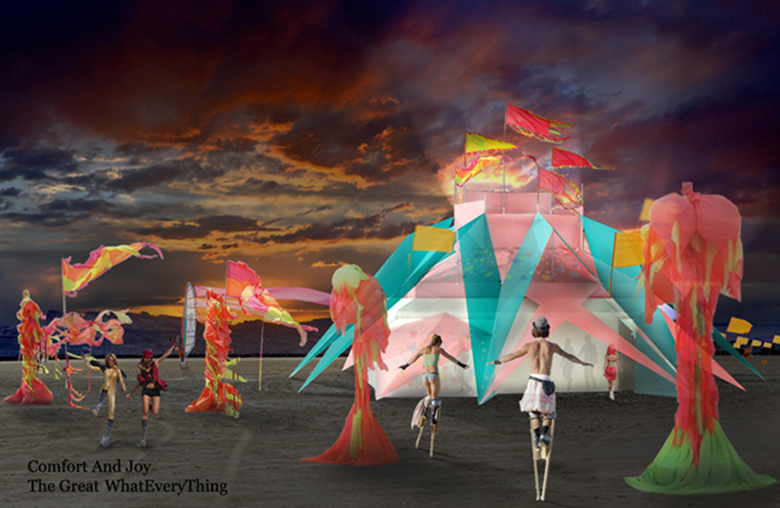 From our exuberant Carrot Dome, visible all across the playa, to the Afterglow tent, trove of treasured memories for its many visitors, C&J’s spaces invite, excite, and inspire creativity and connection. The Burning Man festival and our family continue to grow, and we want to keep expanding our offerings of comfortable and joyous spaces for all to enjoy. To that end, we’ve put a great deal of love and intention into conceptualizing our next public space on the playa: The Tiara. The Tiara is a swirling and colorful tented structure that provides shelter from the elements and can be used by up to 75 Comfort & Joy campers and our neighbors to chill, perform, hold workshops, show films, host talks, dance, play, create, and more. Decorated with plush pillows and soft lighting, The Tiara will be a jewel in the desert. The open air design includes an oculus to welcome the light of the sun and the moon and the stars, while protecting guests from the wind and the dust. Its winding entrance calms and soothes the spirit, while slowly introducing the visitor to the programming inside and minimizing disruptions. The Tiara will be constructed using commonly available aluminum pipes and intersections, so it is light, yet strong and portable. The fabric covering is colored shade cloth—tough enough to handle the whipping winds with aplomb. It is reusable, reconfigurable, expandable and easily repaired.